[Discontinued] When I teased the S'mores flavor, I didn't actually mean to make you wait over two weeks for the review. So, without further ado, let's dig in! 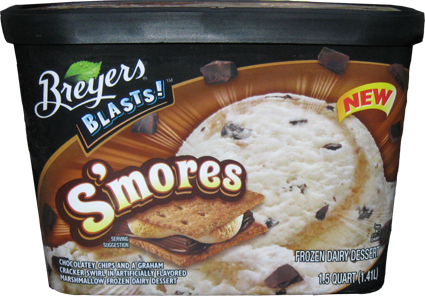 This is the new Breyers BLASTS! S'mores treat which is Chocolate chips and a graham cracker swirl in artificially flavored marshmallow frozen dairy dessert. Mmmmmm, robust artificial flavor... I mean mmmm, graham cracker. Based on this picture, you're probably thinking "well, that swirl looks half decent". Thing is, if you could smell this treat, you would have a totally different first opinion. The artificial smell is clocking in a full 10 out of 10 here. I expected some smell, but this is a little excessive. I am officially afraid. I'm going to cheat again and let you know that I've already run through the first, second and even third scoops. 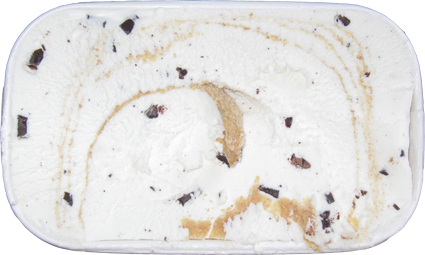 As you might suspect, my first scoop started with that giant chunk of swirl right in the middle of the picture above. Hmmm, my initial impression is that the ice cream is ok and the swirl is pretty good. It's not as great as the thicker Turkey Hill swirl, but since graham cracker swirls aren't exactly common in ice cream, this one will suffice. Now let's get back to that artificial smell. I don't know the last time you had real (and fresh) marshmallow fluff, but it's a lovely, sugary thing that I have loved since we first met. It's not something you eat by itself, but it compliments peanut butter like nothing else. It's a shame this stuff isn't more like marshmallow fluff because it may have been great. Fluff isn't necessarily an intense flavor, but I prefer it to the like cheap dollar store imitation marshmallow puffs that this base reminds me of. So the smell is overpowering and the taste is artificial BUT on second scoop I learned that if you get enough graham cracker swirl on your spoon, you aren't going to care. That's right, the swirl is good enough that if get a lot of it, everything else becomes less important. Throw in the crunch of the fairly numerous chocolate chips and you have yourself a decent treat. With that fairly impressive second scoop in mind, I stole the final bites of S'mores to get a third scoop. Problem is, well, we have a problem.. The artificial and overly sweet nature of this ice cream is starting to bug me. Without the swirl, the base ice cream is just too much. I guess I'll throw this one up as you should still probably try it, but you have been warned. I was hoping this blasts! would be awesome... I recently bought the Mrs. Fields cookie dough flavor... GONE. ALL. GONE. So amazing. I want to try the reese's & waffle cone flavor! What blasts! are you excited to try out? Spot on with this review. On THIRD scoop, I threw this out. It's definitely overpowering with the marshmallowey sweetness/smell. I couldn't handle it. On to the cookie flavors...!!! Oh dear shame it was so artificial tasting :/, it looks like it would be yummy, but looks can be deceiving hehe! So I went on breyers website and they finally updated the site but this flavor isn't up there so I'm thinking you said in the other post that they added it last minute but I think they actually pulled this flavor from the line up and according to your review I can see why they would. nice find there. I was surprised when I thought they killed the heath flavor, so it's good to see it's alive. it still amazes me they said 10 and they've got 16, that's crazy! No wonder it smells and tastes so artificial. Look at the label - its not even ice cream!! Dairy desert can be anything -but its not real ice cream. Cheep artificial non diary ingredients. Light years from where Breyers used to be when they were a good brand. I'm a fan of Turkey Hill Marshmallow ice cream. Besides being real ice cream -their marshmallow is really natural whipped marshmallow -made with egg whites,vanilla and sugar. Good stuff! It's definitely a bit disturbing how much a "dairy dessert" like this is such an opposite to the "all natural" flavors that got them started. I understand why they do it, but at the same time, it is disappointing. Take a lesson from Edy's S'mores ice cream. It is to DIE for. This stuff, yikes, its just nasty.